Having affirmed that two American journalists had been beheaded by Islamic State fighters, and announcing late Tuesday a surge of at least 350 more U.S. military personnel into Iraq, President Obama and other top administration officials on Wednesday struggled to describe the ultimate U.S. objective in battling terrorists whose actions are as barbaric as their media methods are sophisticated. Obama has been faulted for dawdling over foreign policy strategy, and his comments in Estonia before heading to a NATO summit in Wales didn’t help his cause: The president’s efforts to explain an overarching goal in combating the terror group seemed as murky as the options he says are still under consideration. Pressed to expand on his use of the word “destroy” as a goal, the president added qualifiers, suggesting that ISIL would continue to exist, but in a “manageable” form. “Our objective is to make sure that ISIL is not an ongoing threat to the region,” he said. The group, which operates in Syria and has been marching through Iraq like an invading army, needs to be “degraded to the point where it is no longer the kind of factor that we’ve seen it being over the last several months,” Obama added. The president then expanded on what sounded more like a containment strategy. Since videos released by masked ISIL executioners showed the deaths of American prisoners James Foley and Steven Sotloff, public pressure has grown to obliterate a force that amounts to about 15,000 fighters. “We can continue to shrink ISIL’s sphere of influence, its effectiveness, its financing, its military capabilities to the point where it is a manageable problem,” Obama continued. “And the question is going to be making sure we’ve got the right strategy, but also making sure that we’ve got the international will to do it." Moments later, the president said he anticipated the uprising of ISIL “a while back” and said he delivered a speech at West Point three months ago with the Islamic State in mind. In that speech, he argued for international partnerships to combat emerging regional threats. “The question we face … is not whether America will lead, but how we will lead -- not just to secure our peace and prosperity, but also to extend peace and prosperity around the globe,” he said in May. 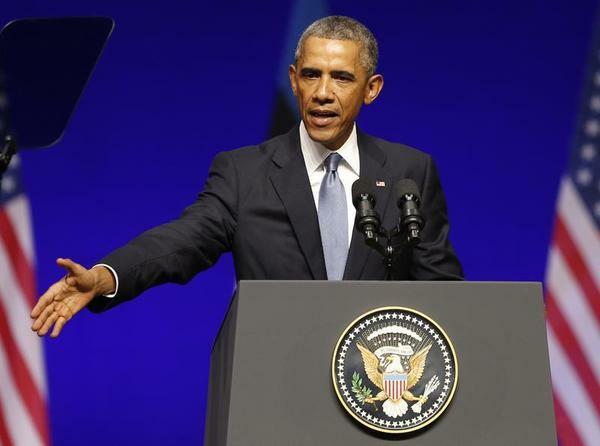 On Wednesday, Obama spoke of U.S. “objectives” -- plural. His rhetoric dashed the hopes of White House aides who hoped the president might recover from his candid comment last week that the U.S. does not have a strategy “yet” about whether to strike ISIL inside Syria. As the president embraced the notion of “managing” the existing ISIL threat, Vice President Joe Biden delivered fiery remarks vowing a more dramatic end for those who beheaded Foley and Sotloff. "We will follow them to the gates of hell until they are brought to justice," Biden said at the Portsmouth Naval Yard in Maine, “because hell is where they'll reside." Hours later, Defense Secretary Chuck Hagel attempted to smooth over the differences between Obama’s seemingly cool rhetoric and Biden’s brimstone declarations. Noting the president wants to prevent ISIL from becoming a terrorist threat to the U.S. homeland, the secretary nevertheless appeared to counter Obama’s suggestion that the Islamic State group could be rendered “manageable” anytime soon.